The creative portrait session was the most intense and fun part of this Roma's Hospitality Centre wedding day. First, it is always a pleasure and the challenge to deal with the large bridal party. In this case there were seven bridesmaids and seven groomsmen who were, at times, difficult to direct. Second, the bride and groom set the photoshoot for 2 PM on a hot sunny summer day. That in itself can ruin the outcome of the wedding pictures. Fortunately, I was prepared and let these images using a Profoto B1 strobe. As such, I was able to overpower the sun and create to create high quality wedding pictures. In the image on the left, I dropped to the ground and photographed everybody against the sky. The bride is flanked by her bridesmaids who are positioned in a semicircle. To avoid the deep shadows caused by the sun's position right above us, a placed my strobe right in front of the bridesmaids. To capture this image I use the Canon 24 to 70mm lens shot at 24 mm. 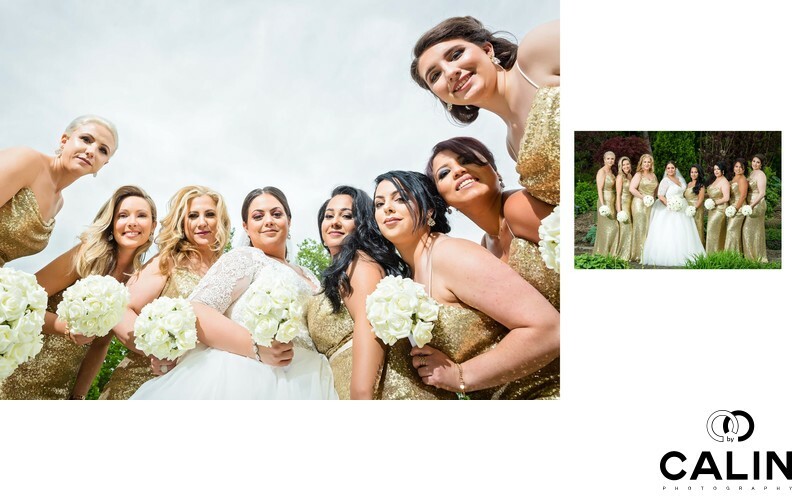 The image on the right is a more traditional wedding photo featuring the bride and the girls looking at the camera. I shot both images at F7.1 so that the bride and her bridesmaids are all in focus.